The Roman Catholic Archbishop of El Salvador, Oscar Romero, was assassinated in March 1980. The former Archbishop of Canterbury Rowan Williams led an Anglican delegation to the Vatican this weekend for the canonisation of Oscar Romero. The current Archbishop, Justin Welby, sent a letter to Pope Francis in which he described the former Archbishop of San Salvador, who was assassinated as he celebrated Mass in March 1980, as “a true example to all Christians, and particularly to our fellow bishops.” The weekend’s service at St Peter’s Basilica in the Vatican, also saw the canonisation of Pope Paul VI and five other saints: Francesco Spinelli, Vincenzo Romano, Maria Catherine Kasper, Nazaria Ignazia of Saint Teresa of Jesus, and Nuncio Sulprizio. In his letter to Pope Francis, Archbishop Justin said of Oscar Romero: “as a champion of peace and justice he stood up against oppression and was consistently on the side of the poor, the underprivileged and the marginalised. In this he emphasised and demonstrated the love of Christ himself. Former Archbishop of Canterbury Rowan Williams with some of the Anglican delegation at the Vatican yesterday (Sunday) for the canonisation of Oscar Romero. Bishop Rowan led a delegation of 10 Anglican bishops at the service, which included the suffragan Bishop in Europe, David Hamid. “In my time as Mission Coordinator for Latin America and the Caribbean for the Anglican Church of Canada during the years of the civil wars in El Salvador and other Central American countries, I made many visits to the region, most often in support of those seeking to defend the human rights of the poor and exploited, including many priests and pastors in El Salvador,” Bishop David said in a blog post after the service. 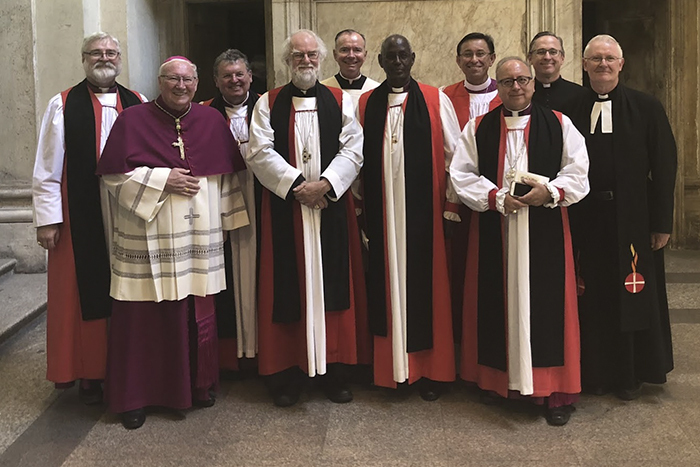 Former Archbishop of Canterbury Rowan Williams with the Anglican and Methodist delegations to the Vatican yesterday (Sunday) for the canonisation of Oscar Romero, with Bishop Brian Farrell, the Secretary of the Pontifical Council for Promoting Christian Unity. Pope Paul VI was the first Pope to receive an official visit by an Archbishop of Canterbury since the Reformation, when, in 1966, he welcomed Archbishop Michael Ramsey to the Vatican, famously giving him his episcopal ring. During the service, Pope Francis used three symbolic and historic elements, including the Pope Paul VI’s favourite chalice and pastoral cross. He also wore the blood-stained cincture that Romero was wearing when he was murdered. 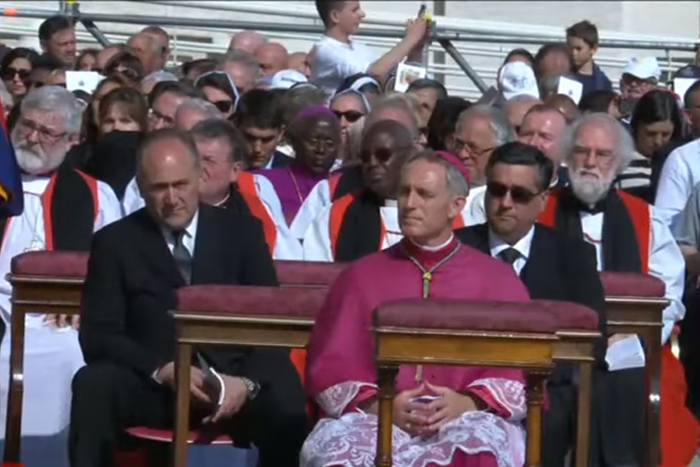 Following the service, Pope Francis delivered his weekly Angelus address to some 70,000 pilgrims in St Peter’s Square. During this, he gave a special welcome to Bishop Rowan and the Anglican delegation, expressing his “deep gratitude” that they were there representing Archbishop Justin Welby. Romero was assassinated on the eve of Archbishop Robert Runcie’s installation in Canterbury Cathedral on 25 March 1980. In response, Archbishop Robert made a point of going to the spot in the Cathedral at which Archbishop Thomas Becket was martyred eight centuries earlier to offer prayers during the installation liturgy in an act of solidarity following the killing. He began his statement by saying: “Saint Romero was assassinated coldly and with planning, because he had a passion for defending women and men who were exploited, mistreated, victims of human rights violations. He pointed out those who were responsible and he asked for their conversion to Christ.